Recently, a team of researchers at the Samsung Advanced Institute of Technology (SAIT) developed a “graphene* ball,” a unique battery material that enables a 45% increase in capacity, and five times faster charging speeds than standard lithium-ion batteries. The breakthrough provides promise for the next generation secondary battery market, particularly related to mobile devices and electric vehicles. In its research, SAIT collaborated closely with Samsung SDI as well as a team from Seoul National University’s School of Chemical and Biological Engineering. Lithium-ion batteries were first commercialized in 1991, and widely applied to markets for mobile devices and electric vehicles. However, with standard lithium batteries requiring charging times of at least an hour to fully charge, even with quick charging technology, and considered to have reached their limit for capacity expansion, there have been numerous attempts to explore use of new innovative materials. Among the materials looked at, graphene has widely become the primary source of interest as the representative next generation material. In theory, a battery based on the “graphene ball” material requires only 12 minutes to fully charge. Additionally, the battery can maintain a highly stable 60 degree Celsius temperature, with stable battery temperatures particularly key for electric vehicles. In its research, SAIT sought for an approach to apply graphene, a material with high strength and conductivity to batteries, and discovered a mechanism to mass synthesize graphene into a 3D form like popcorn using affordable silica (SiO2). 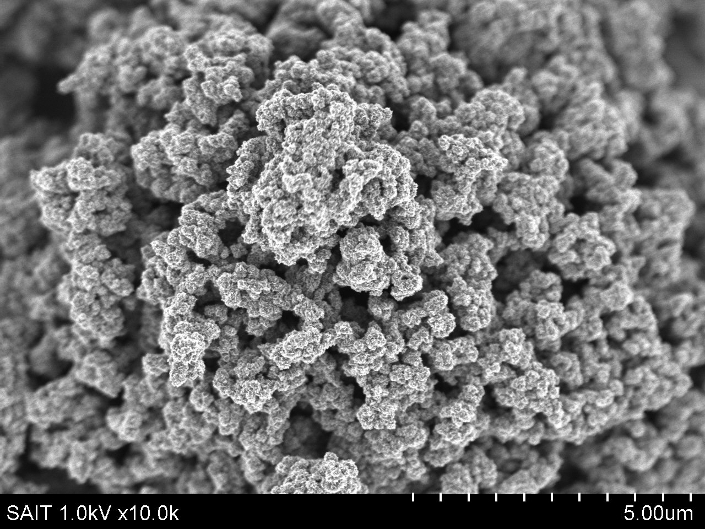 This “graphene ball” was utilized for both the anode protective layer and cathode materials in lithium-ion batteries. This ensured an increase of charging capacity, decrease of charging time as well as stable temperatures. SAIT’s research results are covered in-depth in this month’s edition of the science journal Nature Communications in an article entitled, “Graphene balls for lithium rechargeable batteries with fast charging and high volumetric energy densities.” SAIT has also filed two applications for the “graphene ball” technology patent in the US and Korea. *Graphene is a single layer of carbon atoms from graphite, and is receiving much attention in the battery and display industry due to its physical, chemical stability. Graphene is 100 times more effective than copper in conducting electricity and displays remarkable electron mobility – 140 times faster than silicon – which makes it an ideal material for fast charge.